This product is manufactured to order, please contact us for more info. Please contact the lab for more information. 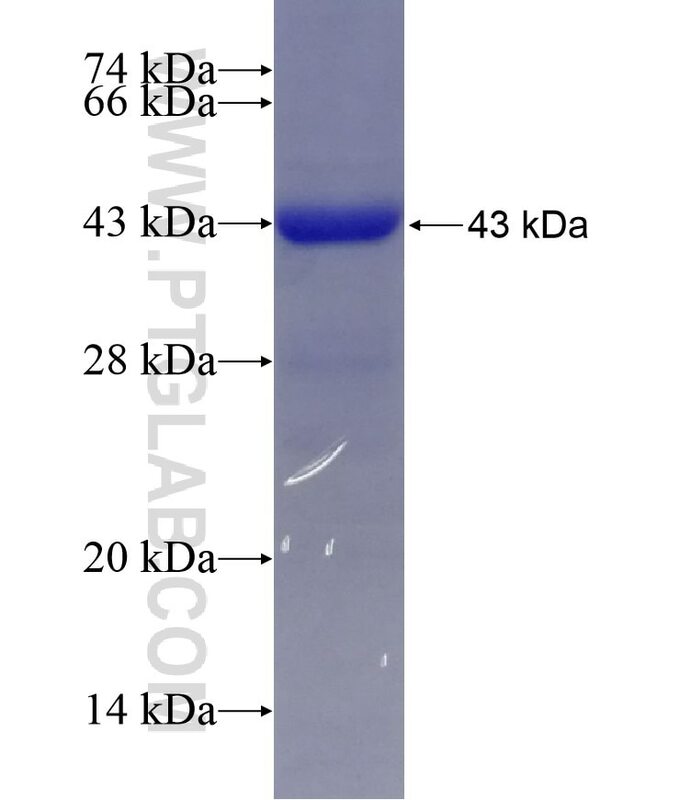 95%, by SDS-PAGE with Coomassie Brilliant Blue staining. The purified protein was Lyophilized from sterile PBS (58mM Na2HPO4,17mM NaH2PO4, 68mM NaCl, pH7.). 5 % trehalose and 5 % mannitol are added as protectants before lyophilization. Reconstitute at 0.25 µg/μl in 200 μl sterile water for short-term storage. Reconstitution with 200 μl 50% glycerol solution is recommended for longer term storage (see Stability and Storage for more details). If a different concentration is needed for your purposes please adjust the reconstitution volume as required (please note: the ion concentration of the final solution will vary according to the volume used). Note: Centrifuge vial before opening. When reconstituting, gently pipet and wash down the sides of the vial to ensure full recovery of the protein into solution. The product is shipped at ambient temperature. Upon receipt, store it immediately at the recommended temperature (see below). Store for up to 12 months at -20°C to -80°C as lyophilized powder. Short-term storage: Store at 2-8°C for (1-2 weeks). Long-term storage: Aliquot and store at -20°C to -80°C for up to 3 months, buffer containing 50% glycerol is recommended for reconstitution. Avoid repeat freeze-thaw cycles.